After moving to the northeastern U.S., I became intrigued by the numerous historic parkways that crisscross parts of New York, Connecticut, New Jersey, and some neighboring states. They’re a pleasant alternative to the interstate highways, primarily due to their scenic qualities and absence of commercial truck traffic. I have only traveled on a few of these picturesque roads so far, but I look forward to experiencing more of them. Historic parkways can be found elsewhere in this country, but not at such a high concentration as one will find in the northeast, especially in New York City and surrounding areas. In fact, the first parkway built in the U.S. was the Eastern Parkway in Brooklyn, designed in 1866 by landscape architect Frederick Law Olmsted and architect/designer Calvert Vaux. These two coined the term “parkway”, whose original intent was to provide a scenic connection to and between parks. Eastern Parkway terminates at Prospect Park, also designed by Olmsted and Vaux. After World War I, the newer parkways took on several distinguishing characteristics. These include the exclusion of commercial vehicles, limiting access to a few interchanges, curvilinear alignments, and emphasis on experience (instead of getting to one’s destination as quickly as possible). Also, the land acquisitions became much wider with these later parkways, providing better buffering from surrounding development. The first road to be designed in this manner was the Bronx River Parkway, built in 1923. Landscape architects and engineers worked as teams designing many of these parkways. These two professions collaborated on determining alignment of the roadways, which included many ecological and scenic considerations. Although landscape architects designed the parkway plantings as well, this was only one small part of their role. 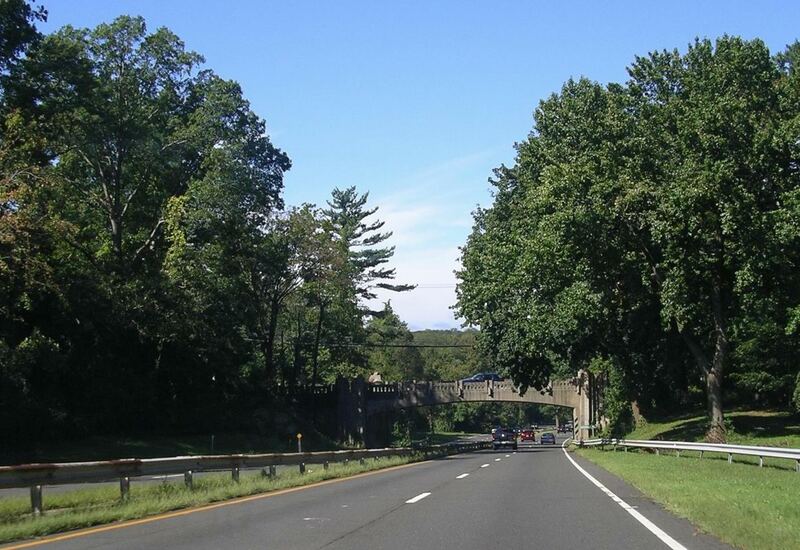 Below are some photos of the Merritt Parkway in Connecticut, which I traveled for the first time this month. I was amazed by the variety of bridges along this roadway, most of which are outstanding works of art, executed in a range of styles. Also, the many mature trees along this 37.5-mile stretch of road, including some in the medians, make the drive a very pleasant experience. 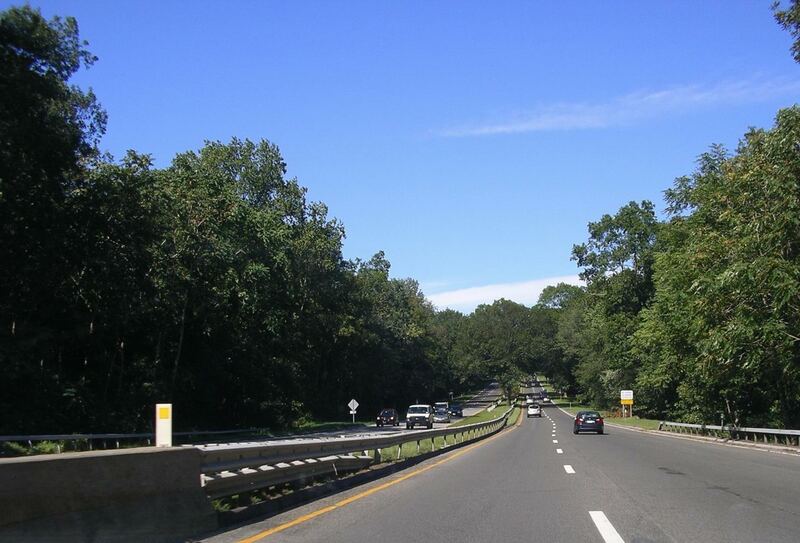 Unfortunately, the decorative elements on some of the bridges are deteriorating, and the Merritt Parkway has also suffered from other symptoms of neglect. The National Trust for Historic Preservation included it in its 2010 list as one of America’s most endangered historic places. Many historic parkways in this region have been facing the pressures of increasing traffic over the decades since they were built. Insensitive alterations and lack of maintenance have also contributed to their decline. I remain hopeful that funds will become available to restore these roadways after this nation’s economy improves. Perhaps reducing and enforcing speed limits would also discourage drivers from using the parkways for their daily commutes, and return them to their original intent as scenic byways. 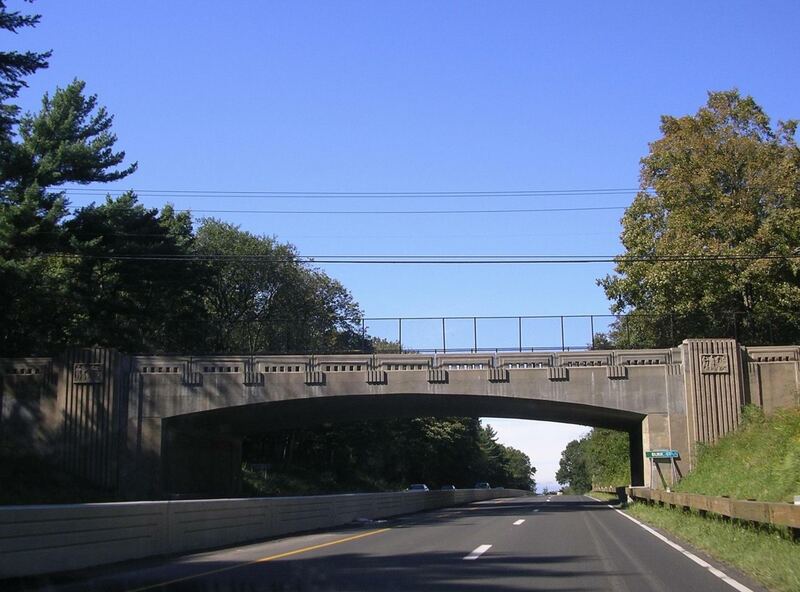 One of 66 unique bridges on the Merritt Parkway. This one includes small bas-reliefs on the abutments. 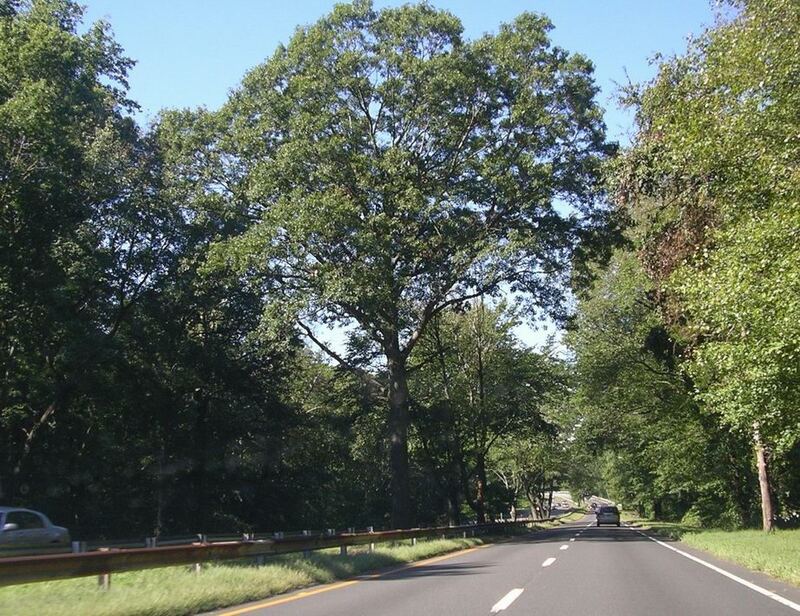 There are many mature trees along the Merritt Parkway.